The sheer fascination that begins upon arrival, with the breathtaking view of the famous Brandenburg Gate – equally impressive by day or by night – gets guests in the mood for a memorable stay at the legendary Hotel Adlon Kempinski. The Hotel Adlon owes its name to its original owner, Lorenz Adlon, who invested 20 million gold marks and two years into the creation of the hotel, which first opened on October 23, 1907. After burning down in WWII and literally being re-born from the ashes, admittedly with some decades delay, the new Adlon has quickly reclaimed its reputation as Berlin’s most illustrious hotel since its reopening in 1997. Today, the hotel is once again the gathering place of heads of state, royals, politicians, stars and starlets, intellectuals, artists, designers, entrepreneurs, charming roughs, and quirky characters, which ensures that there will never be a dull moment once one enters the magnificent world that is the Adlon. Rebuilt from the original designs of the previous Hotel Adlon, the classic building reflects the grandeur of the ‘Unter den Linden’ boulevard perfectly, where it proudly stands right next to one of Germany’s most historic landmarks - the Brandenburg Gate. 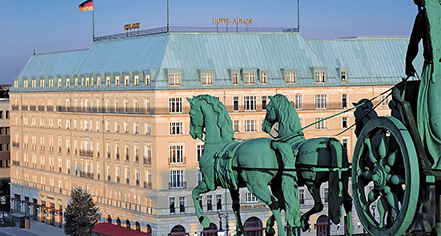 This grand hotel proudly features 304 spacious guestrooms and 78 lavish suites, three restaurants (one of which was awarded two Michelin stars), two bars, 15 meeting and event rooms plus the grand ballroom and the Adlon Palais, a fitness center with an indoor pool, and an exquisite Adlon Spa by Resense. 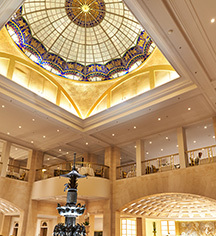 The hotel’s location is the most prestigious in the German capital. Any major outdoor event in the city will have its start or finish at the Brandenburg Gate and therefore will be at the hotel’s doorstep. It is in the middle of the governmental and Embassy district as well. Berlin’s most significant sights and monuments are only a stroll away. A comprehensive cultural repertoire, such as the Museum Island and exclusive shopping opportunities, is easily accessible via public transport, which is within walking distance. Hotel Adlon Kempinski, a member of Historic Hotels Worldwide since 2017, dates back to 1907. Greta Garbo's famous line, "I want to be alone," were whispered at the Hotel Adlon during the filming of Grand Hotel, which was based on the Hotel Adlon. Airport Transportation: An airport shuttle may be arranged through the hotel's concierge, rates apply. EUR 150 to Airport TXL, EUR 180 to Airport SXF. Extra Person Fees: EUR 150 per adult (max. 3 adults per room). Hotel/Resort Fees & Taxes: A city tax is imposed by the city of Berlin. Business travelers with proof of business-related travel are exempt from this tax. For more details, please contact the property using the information on the reservation confirmation received after booking. Learn more about the History of Hotel Adlon Kempinski .